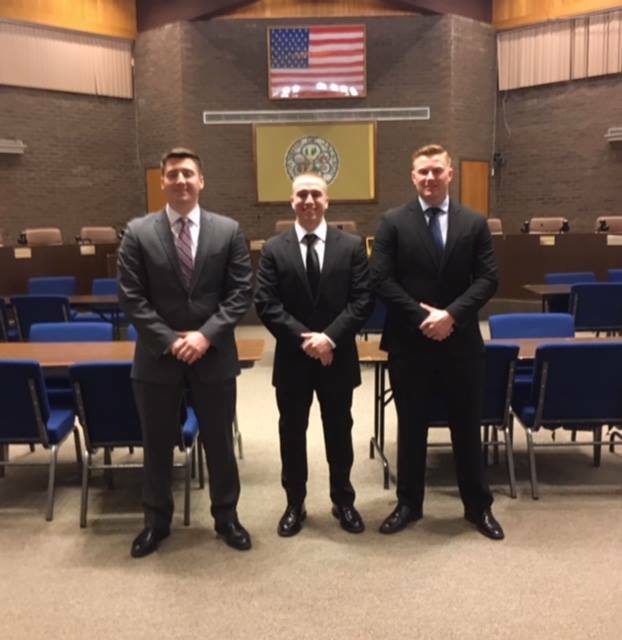 The Jackson Police Department would like to welcome aboard our two newest police officers and one Class 2 special police officer who were sworn in by the Township Clerk and appointed to their new positions on March 12, 2018. Robert Gravina, age 24 was appointed as a police officer with the Jackson Police Department. He had previously graduated the New Jersey State Correctional Academy in Sea Girt and was employed as a corrections officer with the New Jersey Department of Corrections. He will be attending the Ocean County Police Academy and upon graduation will be assigned to a field training officer for additional training before being assigned to a patrol squad for solo patrol. Matthew Colangelo, age 23 was appointed as a police officer with the Jackson Police Department. He previously served in the United States Marine Corps and as a class 2 special police officer with the Union Beach Police Department. He had previously graduated the Monmouth County Police Academy and the Ocean County Police Academy waiver course to obtain his full certification for police officer. He will be assigned to a field training officer for several months of field training where upon successful completion of the program, he will be assigned to a patrol squad for solo patrol. Randall Trasky, age 22 was appointed as a class 2 special police officer with the Jackson Police Department. He had previously attended the Ocean County Police Academy and recently served as a class 2 special police officer with the Freehold Township Police Department. He will be assigned to a field training officer for several months of field training where upon successful completion of the program, he will be assigned to assignments with court security, traffic duties and details and assisting patrol officers as needed. We congratulate the officers as they begin their new careers with the Jackson Police Department and would like to thank the Mayor, Council and Administration for their continued support of the police department as the agency grows to serve the growing township, its residents and visitors. It is anticipated at this time that over the next several days, there will be one additional officer appointed to attend the Ocean County Police Academy. Including these most recent appointments, the department is currently staffed with 90 fully sworn police officers to serve the 100 square mile township and its approximate 60,000 residents along with businesses and attractions which can bring thousands of additional visitors to town on a daily basis. We would also like to thank all of the town’s residents for their support of the agency and our officers.